Poe, Edgar Allan (1809-1849), American writer, known as a poet and critic but most famous as the first master of the short story form, especially tales of the mysterious and macabre. Poe was born in Boston on January 19, 1809. 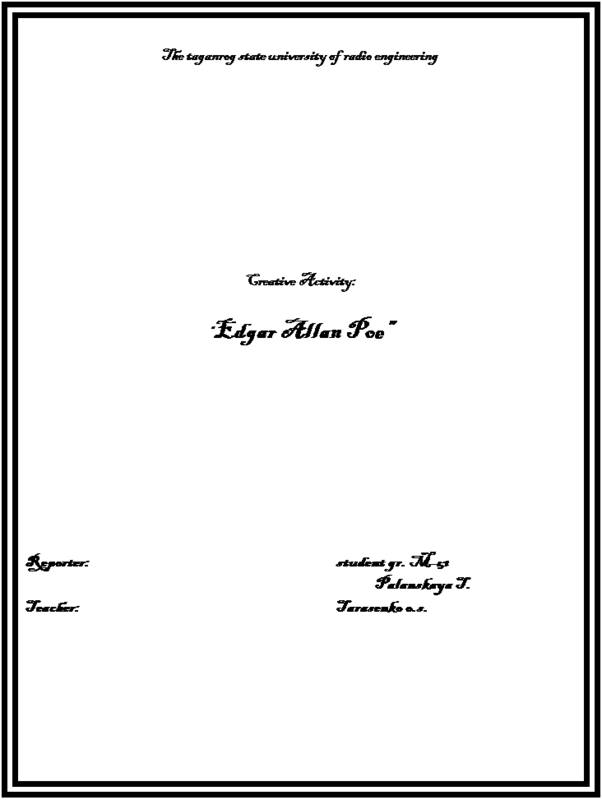 His parents, touring actors, both died in Poe's early childhood, and the boy was raised by John Allan, a successful businessman of Richmond, Virginia who was presumably his godfather. Taken by the Allan family to England at the age of six, he was placed in a private school. Upon returning to the United States in 1820 he continued to study in private schools and attended the University of Virginia for a year, but in 1827 his foster father, displeased by the young man's drinking and gambling, refused to pay his debts and forced him to work as a clerk. Poe, disliking his new duties intensely, left the job, thus estranging Allan, and went to Boston. There his first book, Tamerlane and Other Poems (1827), was published anonymously. Shortly afterwards Poe enlisted in the US Army and served a 2-year term. In 1829 his second volume of verse, Al Aaraaf, was published, and he effected a reconciliation with Allan, who secured him an appointment to the US Military Academy. After only a few months at the academy Poe was dismissed for neglect of duty, and his foster father disowned him permanently. Poe's third book, Poems, appeared in 1831, and the following year he moved to Baltimore, where he lived with his aunt and her 11-year-old daughter, Virginia Clemm. The following year his tale “A MS. Found in a Bottle” won a contest sponsored by the Baltimore Saturday Visitor. From 1835 to 1837 Poe was an editor of the Southern Literary Messenger. In 1836 he married his young cousin. Through the next decade, much of which was marred by his wife's long illness, Poe worked as an editor for various periodicals in Philadelphia and New York. In 1847 Virginia died and Poe himself became ill; his disastrous alcohol addiction and his alleged use of drugs may have contributed to his early death in Baltimore, on October 7, 1849. Poe, by his own choice, was a poet, but economic necessity forced him to turn to the relatively profitable genre of prose. Whether or not Poe invented the short story, it is certain that he originated the novel of detection. Perhaps his best-known tale in this genre is “The Gold Bug” (1843), about a search for buried treasure. “The Murders in the Rue Morgue” (1841), “The Mystery of Marie Rogkt” (1842-1843), and “The Purloined Letter” (1844) are regarded as predecessors of the modern mystery, or detective, story. Many of Poe's tales are distinguished by the author's unique grotesque inventiveness in addition to his superb plot construction. Such stories include “The Fall of the House of Usher” (1839); “The Pit and the Pendulum” (1842); “The Tell-Tale Heart” (1843); and “The Cask of Amontillado” (1846). Эдгар Алан По (1809-1849), американский писатель, известный как поэт и критик, но наиболее известен как мастер коротких историй, особенно рассказов про таинственное и жуткое. По родился в Бостоне в 19 января 1809 года. Его родители, бродячие артисты, оба умерли еще в его раннем детстве. И мальчика вырастил Джон Алан, успешный бизнесмен из Ричмонда, Виржиния, который возможно был его крестным отцом. В шесть лет семья Аланов забрала его в Англию, где он был помещен в частную школу. После возвращения в Соединенные Штаты в 1820 он продолжил обучение в частной школе и посещал университет в Виржинии в течение года. Но в 1827 году его приемный отец, недовольный тем, что молодой человек злоупотребляет спиртными напитками и азартными играми, отказался оплачивать его долги и вынудил его работать клерком. По сильно невзлюбил свои новые обязанности, оставил работу, таким образом, отдаляя Алана, и поехал в Бостон. Там его первая книга, «Tamerlane and Other Poems» (1827), была опубликована анонимно. В скором будущем По поступил на военную службу в американскую армию и прослужил два года. В 1829 году его вторая книга стихов, « Al Aaraaf», была опубликована, и он помирился с Аланом, который гарантировал ему назначение в американскую военную академию. После нескольких месяцев в академии По был уволен за пренебрежение своими обязанностями, и его приемный отец отказался от него навсегда. 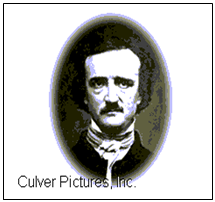 Edgar Allan Poe is American writer, known as the first master of the short story, especially tales of the mysterious. He was born in Boston on January 19, 1809. His parents died and he was raised by John Allan, who was presumably his godfather. Poe was placed in a private school. Later he attended the University for a year, but his foster father, displeased by the Poe`s drinking and gambling, refused to pay his debts and forced him to work as a clerk. Poe left a job, thus estranging Allan. He begins to write. His first book, “Tamerlane and Other Poems”, was published anonymously. His second volume of verse “Al Aaraaf”. Poe`s third book, “Poems”, appeared in 1831. The following year his tale “A Ms. Found in a Bottle” won a contest. From 1835 to 1837 Poe was an editor. In 1836 he married his young cousin. Through the next decade, much of which was marred by his wife`s illness, Poe worked as an editor for various periodicals. In 1847 his wife died and Poe himself became ill. He died in October 7,1849.
ü What did he do from 1835 to 1837? ü What was his wife? ü What is the name of his first book? ü When did he die?